UnitedPeople is a Dail registered political party. Official address: 31 Beaulieu View, Drogheda. Co Louth. Ireland. Website designed by Clear And Graphic. Have any questions? Please feel free to ask. Tell us what you are thinking or concerned about. By using this form I agree with the storage and handling of my data by this website. I consent UnitedPeople to use this data to contact me. I understand my data is not shared externally with individuals, state departments or commercial businesses. I understand UnitedPeople does not process my data. Unsubscribe Me And Delete My Data. Please delete my personal data and unsubscribe me from future correspondence. Other information (name, address, phone number, etc) I also consider useful to UnitedPeople that would be helpful to total removal of my personal data. UnitedPeople does not collect personal information and then share it externally to other individuals, state departments or commercial businesses. We consider your information (your data) as your personal asset. As such, we treasure it securely as we would any other possession that we would physical or financial asset possess also. UnitedPeople does not process personal information - only stores it. UnitedPeople does not process personal information for profit. UnitedPeople does not make your personal information available in any way, to others so that they may profit. Should any requests be submitted to UnitedPeople for access to such data (beyond a person supplying it or requesting its deletion), all such requests will be rejected in accordance with current Irish and European privacy and data protection legislation. Your data is your personal asset. UnitedPeople does not believe it should be given away or processed by anyone without clear express permission gained from the principle owner. Security of your data is important. Click HERE to discover more. UnitedPeople is committed to protecting the security and privacy of your personal data. We do not sell or otherwise market your personal data to anyone for any reason, at any stage and we comply with the applicable laws on data privacy protection and data security. The policy below will help you understand what information UnitedPeople may collect, how we will use and safeguard that information and with whom we may share it, only within the party. Any information we might collect is so that we can provide you with information direct from ourselves. We will not collect any personal data about you (e.g. your name, address, telephone number or e-mail address), unless you voluntarily choose to provide us with it (e.g. by registration, survey), or otherwise provide your consent. When you first register with UnitedPeople. We might collect information from you when you register with the party or are part of a promotion/event UnitedPeople might hold. This information may include personal information, including your full name, phone number, email and home address. When you use our website. When you visit our website, we may use devices known as “cookies”, graphic interchange format files (GIFs), or other similar web tools to enhance your web experience. These tools help us to recognise you, maintain your web session, and provide a more personalised experience. Collectively, any cookie information about you that UnitedPeople might gather from all sources is referred to as “Your Data.”. Your Data does not include information that third parties may independently gather from other websites about you. When you access our website, we may though the existence of cookies, automatically (i.e., not by registration) collect non-personal data (e.g. type of Internet browser and operating system used, domain name of the website from which you came, number of visits, average time spent on the site, pages viewed). We do not share this data onward at any stage. Any requests made to ourselves by others to obtain this type of data will be rejected as appropriate according to current legislation. When you view our website, we may store some data on your computer in the form of a “cookie” to automatically recognise your PC next time you visit. Cookies can help us in many ways, for example, by allowing us to tailor our website to better match your interests or to store your password to save you having to re-enter it each time. If you do not wish to receive cookies, please configure your Internet browser to erase all cookies from your computer’s hard drive, block all cookies or to receive a warning before a cookie is stored. Customise, monitor and improve UnitedPeople and any content or material it provides. To detect fraud and other illegal activities. To attempt to Bill or collect for any applicable fees or charges outstanding. Let you know about new information relevant to UnitedPeople or other related matters you have previous indicated that you would be further interested in. 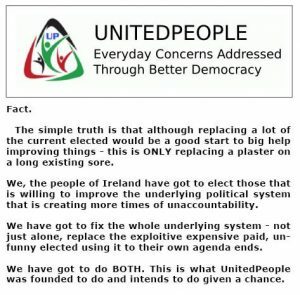 Let you know about changes to the UnitedPeople Party. UnitedPeople may use Your Data in these forms for internal purposes only. UnitedPeople may also use Your Data to customise the UnitedPeople services and make them more relevant to you. For example, UnitedPeople may use such data to make policy recommendations give the way members have voted or voiced opinion. UnitedPeople may use your Registration Data to verify that you are the person authorised to use the UnitedPeople facilities services or to manage any further information gained with your prior permission. UnitedPeople does not share your information to others unauthorised or outside the party. UnitedPeople had a prior incident, soon after its founding when a number of people tried to take over the party, urged a then authorised female senior member, abusing her position previous awarded, into misrepresenting their-self and intention, so that all (including the officer in question) behind the attempted coup, might obtain an early list of previous UnitedPeople members. Upon becoming aware of their intentions, we immediately completely stopped UnitedPeople operations right across the country – everything - including official social media outlets. We immediately contacted the Data Protection office, Garda and instructed a law firm to deal with the matters relating to the attempted incident. The Data Protection office after instigating an investigation we immediately called for, found UnitedPeople total exonerated from any laws possible broken. We openly state that the previous matter occurred. We have nothing to hide and wish to learn at any further opportunity, how to progress the party, the people of Ireland and the country as a whole. We treated the prior matter in that regard - something more to be learned from. From that time onward, we have subsequently taken even more extra precautions beyond what you would find in any business or normal political party, to safeguard the little data we might occasional collect. We hold such data in under very strict conditions and at any stage, no more than two people are able to access it. Each must be told by the other, prior to accessing it for contacting people, that this is the intention, how or when it will occur – and what might be passed on by using such contact information available. If and when necessary, we will again immediately complete shut down UnitedPeople operations or agenda so that people's personal data is vehemently protected. It should always be "people before the party". No other way. Data protection is a very serious matter and a core issue UnitedPeople seeks to progress to the betterment of the public and their legal rights. We treat any possible data breach attempts, should they occur in the future, as extremely serious and will not hesitate to immediately report such matters to the Irish data commissioner, Garda and any other people that should be subsequent involved in protecting citizens - including the citizens themselves first of all. We don’t. If you should decide to instruct us to do so, for any reason, we shall require your permission in written format. This must be verified by also providing I.D. proof, for inspection to UnitedPeople. At no stage will a genuine member or officer ever ask you to provide sensitive private information to the party or those within it, by phone or email. Should you gain a communication asking you to confirm certain details with UnitedPeople by someone - hang up. Through your own independent research, find official contact details for UnitedPeople you feel is more genuine and notify us of any suspicious circumstances you are unsure about. If you are still worried, do contact the Garda and/or Data Protection Office. We take precautions to ensure the information we collect about you is protected and is accessed only by a very limited number of authorised individuals who are knowledgeable about UnitedPeople’ information security practices. UnitedPeople maintains all necessary physical, electronic and procedural safeguards that comply with European standards to guard your non-public personal information. To change any privacy preferences, provide us with any updated information, report suspected fraud or identity theft, or for any other questions, please contact us at. UnitedPeople websites may contain links to other websites. UnitedPeople is not responsible for the privacy practices or the content of other websites. We do however, advise people to check other websites and examine where deemed necessary, their practises and attitude to data security.